Are you considering the addition of a garage to your home? 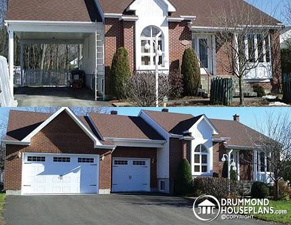 Do you want it detached or attached to the house? Or could you be planning to convert your carport into a garage, or possibly building a room over a detached garage? Now that's a great idea! Adding a garage will not only prove to be very practical, but it will also increase the resale value of your property. building an apartment over a detached garage. The most expensive of the four possible projects is to build an attached garage. Adding an apartment over a garage is also expensive, but it could generate revenue. If you are planning to build a garage attached to your house, take a look at this text. For a garage detached from your house, for instance in the back of your lot, please read these instructions . To convert your carport into a garage, we have provided this information. And finally, to discover six good reasons to build a studio apartment over a detached garage, read the following text. In any case, you will need a garage door. See the different door models from Garaga that will both suit your architectural style and your budget. You can choose Garaga’s Design Centre to create and view a virtual version of your next garage door, then request an online quote. In addition, you can visit us or schedule an appointment with one of our sales representative.